Time to catch up with the Sports Car Challenge: the two race meetings at Brno (September 23/24) and Monza (September 30) brought what looks like a decision in the hunt for the Division 1 title, and also a major scare. The Czech Republic greeted the sportscar competitors with fine weather, but the Czech organisers greeted the series with an eleventh-hour change to the timetable - that had all GT entrants bow out of the race on Saturday, in order to prepare for a 3 hour endurance event later in the day. In Division 1, it was the battle for the title between Wolfgang Payr and Tony Sinclair and the Briton, whose chances for retaining his title were severely hurt by three DNFs earlier in the year, could not afford to miss a beat for the rest of the season. The man from Austria found his position at the head of the points table quite secure. He did what he had to do in race 1, shadowing Sinclair who in turn did all he could do, duly notching up a flag-to-flag win. Division 2 winner, Pius Truffer in the 2.5l BMW-engined PRC was once again invincible in his class, coming home in third place overall. Emanuel Pedrazza serves as chief test driver for the family business, chassis manufacturer PRC; he made a welcome return to competitive driving at Brno. The factory is putting a lot of effort into the new PRC-Honda, and the car seems to have a whole lot of potential. With its engine prepared to FIA Group CN rules, this machine follows the regulations of international series such as VdeV and the Italian Championship, and the PRC factory would like to see it take on all comers in international competition next year. Pedrazza tangled with a competitor in race 1 and was handed a drive-through penalty, that handed the runner-up places behind Truffer to Peter Kormann and sportscar rookie Mirco Schultis. Sunday started with a bang - in the engine bay of Tony Sinclair's Jade. The team hurriedly loaded up and left for the UK, eager to get the car back in raceworthy shape for the trip to Monza where qualifying for the next races would start only six days later. Amid all this, Pius Truffer put his PRC-BMW on pole position, the first time a Division 2 car had done so, with Payr lining up alongside him. Gerd Beisel (above) in the Division 1 PRC, a non-finisher in the first race, and Pedrazza in the small Honda-powered car were on row 2. Truffer was robbed of his excellent position when an overzealous competitor from further back in the field "railroaded" him going into the first corner; both were able to continue, and Trufer gave chase and soon caught up with Beisel. Running in different classes, they nevertheless decided to dice it out the oldfashioned way, and entertained the spectators with a good fight that lasted for several laps. Beisel eventually had the upper hand by only 0.25 seconds. Payr was never challenged for the lead, and once again took maximum points. On the GT podium, after a quiet race, were Kurt Peter, Otto Dragoun, and Peter Bernhard. On to Monza for races 13 and 14, for what may well be the SCC's last visit to the grand old circuit, and the arrival of the Jade Motorsport team at the Autodromo Nazionale was a pleasant surprise. Tony Sinclair was clearly determined to hang on to his slim chance of retaining the Division 1 championship, and clinching the overall Sports Car Challenge title. In the first race on Saturday, it all went frightfully wrong. Coming from a comparatively lowly fifth spot on the grid, Sinclair was in second place and trying to reel in the leader, Emanuel Pedrazza in the PRC-BMW. At the Lesmo curve, Sinclair's car left the track and went into the barrier at almost unabated speed. So severe was the impact that the car penetrated three rows of tyre barriers and pushed the armco itself back by half a metre. Helpers were quick to arrive at the scene, but Sinclair's extrication from the wreck took some time; he was later diagnosed with a broken pelvis and multiple fractures to his legs. Faced with three months in hospital care, he will nevertheless consider himself a lucky man, of sorts. The race ended behind the safety car, and Emanuel Pedrazza took the win. Swiss compatriots Pius Truffer (PRC-BMW, Division 2) and Kurt Peter (Porsche 996, Division 4) were also winners in their respective classes, but it did not matter much. Understandably, the shock of this incident reverberated through the SCC paddock, everyone keeping their fingers crossed as they waited for news on the driver's status - and breathing a sigh of relief when they heard that his first concern immediately after the crash was about his car. 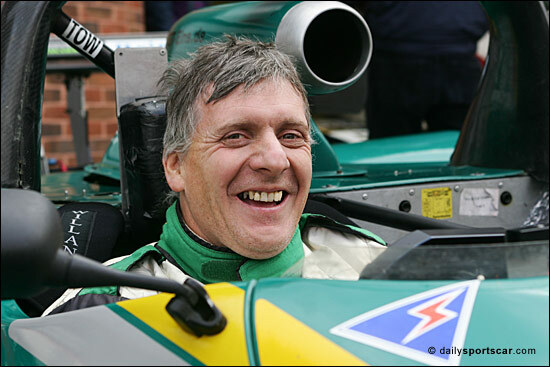 The whole Sports Car Challenge wishes Tony Sinclair (seen on a happier occasion last year, below) a speedy recovery and a return to the racetracks of Europe in 2007. 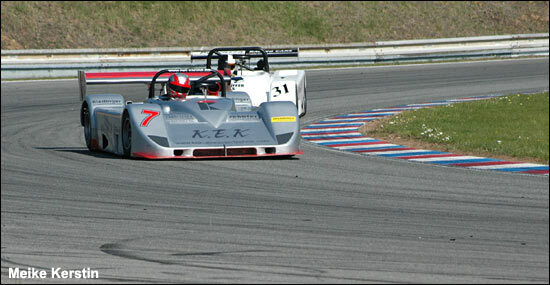 The afternoon race again went to Pedrazza in the lightning-fast, hillclimb-derived PRC, a car campaigned in the German hillclimb series with factory support. With a 3l engine built to Group CN rules, and a favourable power/weight ratio, this is obviously a car that can give the most powerful LMP designs a run for their money in a sprint race. Truffer had to park his car even before the start with incurable vibrations in the drivetrain, so it was "nil points" for him this time out. Wolfgang Payr bounced back from a lowly eleventh place in the morning race, and finished second - yet more points to add to his tally. The other class wins went to Austria's Jörg Peham, with a fine performance in the PRC-Honda in Division 2, and Swiss Porsche driver Mathias Schmitter in Division 4. On Sunday, Payr and Peham took part in a 100 mile race; while Jörg Peham and team mate Paul Pfefferkorn retired with mechanical failure, Payr stormed through the 53 car field from a lowly 32rd starting position. He had chosen the new, light and nimble PRC-Honda over his accustomed, Cosworth-engined powerhouse, and the result proved him right, with a fine second place overall in spite of an altercation with a competitor on the very last lap. 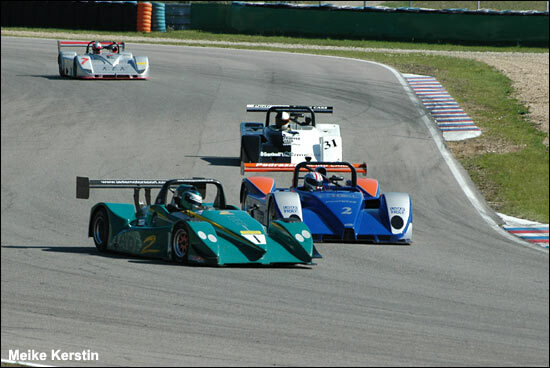 Hockenheim will be the last stop of the 2006 Sports Car Challenge, for two races on October 20/21.